A woman has been fined for taking her horse into a McDonald’s restaurant in Greater Manchester. Police said the woman, who has not been named, was in the saddle when she was initially turned away from the drive-through kiosk on Bury New Road. The woman then led the animal inside, where it “ended up doing his business on the floor”, a Greater Manchester Police (GMP) spokesman said. 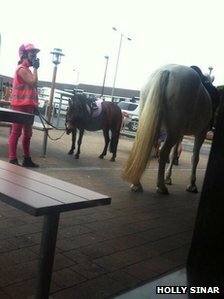 McDonald’s said it was unable to serve customers on horseback. A girl riding a pony also went through the McDonald’s ‘drive-thru’ with the woman. A spokeswoman for the company said: “On 20 July a woman allowed her pony to enter our restaurant in Whitefield after being refused service in the drive-thru lane. 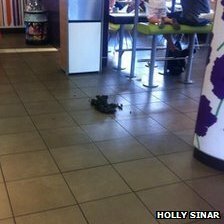 Greater Manchester Police said: “The sight and smell of this caused obvious distress and upset to customers trying to eat, as well as staff members.